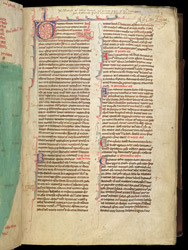 Matthew Paris was born c.1200, and was a monk of St Alban's Abbey from 1217 until his death in 1259; he was a prolific chronicler of national and local events, and several manuscripts in his own handwriting survive. His interests as a writer and artist included heraldry, natural history, ancient gems, and cartography. This is the first page of a copy of Matthew's own manuscript of 'The Flowers of History', a history of the world from the Creation to the year 1251.